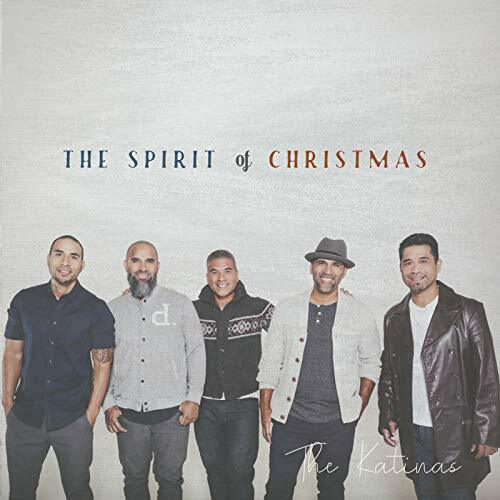 Consisting of 5 brothers of Samoan-American heritage, the former Gotee Records alumni band The Katinas have been recording pop/soul/CCM/worship albums since the mid-1990s. While it can seem like staying together as a band (with no lineup changes) can seem to be impossible (just look at current/former groups Audio Adrenaline, Newsboys, Kutless, Hawk Nelson and Group 1 Crew to name a few), these 5 brothers have stuck together since the group’s inception to bring us some of the best CCM melodies with a Pacific Islander music atmosphere, influenced by their own legacy and culture. With a myriad of popular radio hits over the years (songs like ‘Praying For You’, ‘Home’, ‘Free’, ‘19’, ‘Freedom’, ‘Come Back to Love’ and ‘Changed’ to name a few), The Katinas have now released their brand new EP, full of originally written Christmas songs, as well as a few Christmas carol covers thrown in there for good measure. With the band of brothers (literally) showing a continued and renewed sense of poignancy and enthusiasm not just amongst these 8 songs, but throughout their whole music career thus far, if this this latest musical offering is anything indicative, the band has no intentions of slowing down, and maybe, just maybe, much of their forthcoming material could be their best yet! A must for any lover of Pacific Island worship/CCM music, or even fans of the gospel genre, from Nicole C. Mullen and Tori Kelly, to Mary Mary and Tasha Cobbs Leonard, these 5 brothers (all of whom have a last name of Katina) continue to assert their place within and around the modern CCM genre, reminding us that artists that have been around for a while can still nevertheless reinvent, to bring in more of a younger and relevant crowd. One look through the tracklisting of this 8 track album/long EP, we can see songs that are carols, as well as original songs written by other artists, but covered by the band. ‘Have Yourself a Merry Little Christmas’, originally debuted on youtube a little under a year ago, is included as a song that is a reminder for us to all take the time and enjoy this time where organically and unintentionally, we often busy ourselves to the point of not even enjoying such a season as Christmastime. Quite possibly the most popular non-religious Christmas song there ever is, ‘Have Yourself a Merry Little Christmas’ is a song full of heart and emotion, a song about longing for simpler times where we just reflect upon the simple gift of Jesus for us, rather than amassing things during this time, things we may not need in a personal sense. The Katinas also unveil to us other carols like ‘Joy to the World’ (a rerecording from their 2004 Christmas album Family Christmas) as well as ‘It Came Upon a Midnight Clear’, arguably one of the most obscure and even underappreciated and even unknown Christmas carols…ever. With ‘Wonderful Christmastime’ a song originally written and recorded by Sir Paul McCartney back in the day, and re-recorded by a vast majority of other artists over the years (inclusive of Jars of Clay from their 2007 Christmas album Christmas Songs), The Katinas have decided to place their own Samoan spin on a song that has become one of the most popular non-religious Christmas songs in a while. While also tackling Amy Grant’s ‘Grown Up Christmas List’ as well as her more recent hit ‘Tennessee Christmas’, we see that songs that have been made famous by one artist can still translate well- message and style, when sung by another artist. Sure many covers of Christmas songs can be with the most best of intentions, but the execution could still be sub-par; but what is unique about these 5 brothers is that their passion and service to stay faithful to original recordings of said songs, but still giving their own Pacific Island flavour to them as well, makes the group arguably one of today’s most underrated sibling bands ever. The Katinas also offer their own versions of other lesser known Christmas songs- if you were never a fan of the original artists, you may not have heard songs like ‘Give Love on Christmas Day’, originally by the Jackson 5, nor would you even know the title track ‘Spirit of Christmas’, originally borne into life by soul singer legend Ray Charles. Nevertheless, The Katinas place their own spin on these Christmas classics, giving to us songs about Christmas that we may not have heard, had we not listened to this EP. Even without the label of Gotee Records, The Katinas have once again showed us an arrangement of both originally written Christmas songs, Christmas carols, and Christmas covers of original songs from other artists, are undertaken with much poignancy and grace, that we can’t help but sing alongside the band. A must for anyone who loves Christmas music, worship music or any one of the many movements around the world who deliver great Christmas music, The Spirit of Christmas encourages us all to declare these truths this Christmas season, on a continual basis, as we acknowledge and look upon the Lord in awe and wonder, understanding full well the amount of effort the Lord undertook for Christ Jesus to insert Himself into our reality and history for all mankind! On the back of their highly successful album 19, this new album is as well rounded as it could be, reminding us of the special moments that Christmas brings to us, as we understand that to sing these songs is to worship, regardless of whether they are blasted full pelt in a worship service, or if they are just background music in a department store. Well done to the band for this well-rounded EP, can’t wait till the next full length album after 19, whenever it may come!